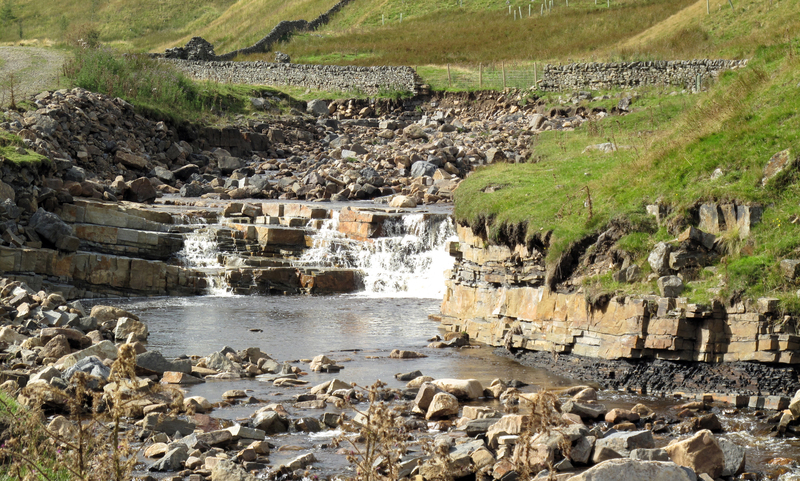 This waterfall is just over 300 metres above sea level on the Hopeburn stream that feeds into a large reservoir in Weardale, Co Durham. 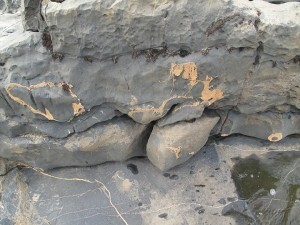 Walking here you quickly find evidence that the rock in falls over was once seabed. 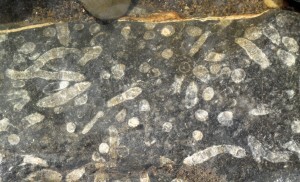 This hard limestone is close to what is known locally as “Frosterly marble”, columns of which can be found in Durham cathedral. Obviously I was delighted to find this on one of my “home patches’, with geological transgression on my mind as it is at present. While we were walking in Co Durham the other morning my wife Natalie asked me how my project work with Antony Lyons was going. We then got into a conversation about language – the term ‘transgression’ in particular and related terms more generally. As our old friend the artist Simon Read often points out, the language around marine transgression is essentially military – we either ‘defend’ coastlines or we ‘retreat’ in the face of coastal erosion or flooding. However, this way of thinking seems increasingly unhelpful in terms of finding more creative approaches to the ecological issues we now face, given that man-made marine transgression is becoming a more and more serious problem in terms of the future. What we need, I believe, is to start to think transversally, to shift our language use so that it is oriented to an attitude of cooperative adaptation and celebration. This might prepare us to make better use of what, for example, is beginning to emerge in terms of rethinking coastal management in the USA. A recent article on natural forms of protection against the more extreme forms of storm damage in coastal areas points out that in the USA: “Coastal forests, coral reefs, sand dunes and wetlands are just a few of the natural habitats that protect two-thirds of the US coastline from hazards such as hurricane storm surges”. That is to say, a situation that can be seen as supporting plans to move beyond over-reliance on engineered solutions such as levees or seawalls. The survey to which the article refers to is designed to look at the cost-effectiveness of conservation-based protection such as wetland restoration and dune creation, along with other protective factors such as coral and oyster reefs, wetlands, dunes, seagrass beds and kelp forests (see http://www.nature.com/news/natural-defences-can-sharply-limit-coastal-damage-1.13380). 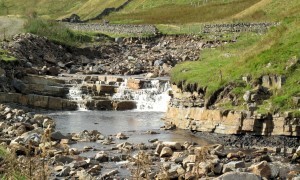 This same shift may already have started in a small way in parts of the UK, where coastlines are managed by organizations such as the National Trust. trans·gres·sion (noun) – 1. A violation of a law, command, or duty: “The same transgressions should be visited with equal severity on both man and woman” (Elizabeth Cady Stanton). 2. The exceeding of due bounds or limits. 3. A relative rise in sea level resulting in deposition of marine strata over terrestrial strata. But it seems to me that the second sense of transgression is also relevant to discussions we’ve been having about climate change, changes in sea level, and the need for adaptation. What Natalie was pointing out to me is that, although the concept of transgression appears to be very much rooted in religious thinking, when seen from a scientific perspective the results of climate change, which are too rapid to allow for adaptation, are also said to ‘transgress’ in so far as they exceed what might be regarded as ‘due bounds or limits’ – but only if we assume a world understood from a gradualist evolutionary perspective. These assumed limits are in reality unrelated to anything ‘natural’ – such as, for example, a tree’s tolerance of the saline content in ground water. They relate only to a particular human perception of what constitutes ‘acceptable’ time-scales and limits, given a particular theory of how nature should behave! Which brings us to the related term: ‘ingess’. in·gress (noun) – also in·gres·sion: 1. A going in or entering – 2. Right or permission to enter. 3. A means or place of entering. At the risk of appearing rather pedantic, it is possible to imagine starting to shift our psychological attitudes to marine transgression by, for example, talking not about either ‘defending’ coastlines or ‘retreating’ in the face of the sea’s threat to coastal erosion or flooding, but instead of accepting that, given what humans have done in terms of creating climate change, the sea will now require ingress – both as a ‘point of entry’ and as something those who have ownership of/authority for coastal management need to ‘permit’ in appropriate areas so as to avoid substantial problems in others. This kind of lateral thinking / speaking may be a small but useful start to thinking otherwise. Antony tells me that this – about the size of a slightly squashed half football – is possibly the fossil remains of a tabulate coral (or something similar!) 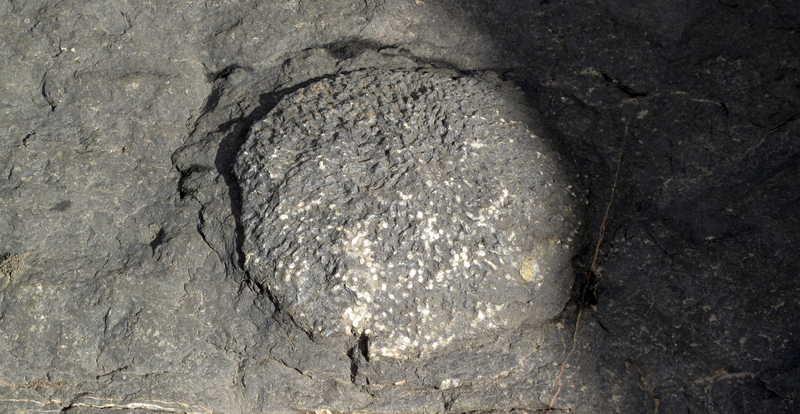 This extinct coral almost always formed colonies of individual hexagonal cells defined by a calcite skeleton like a honeycomb. They lived entirely during the Paleozoic period and are characteristic of the shallow waters of the Silurian and Devonian periods. But as transgression occurred during the Devonian tabulate corals became less and less common. They finally became extinct in what is known as the Permian-Triassic extinction event. But even if it’s the fossil of a different coral, the point remains the same. 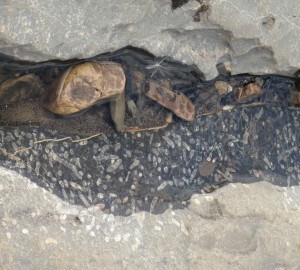 And here one is now, millions of years and 300 metres plus, sitting embedded in a stone sill in Co. Durham. This entry was posted in Projects on September 11, 2013 by Iain.